Huge congratulations to Muzala and Bruce who celebrated their wedding at The Lawn, Rochford on Saturday 11th March 2017 after their church ceremony in the City of London. Apparently the guests were being driven to The Lawn on big red London buses – how fab! The happy couple chose our “Bella” wedding cake from our Off the Peg range but with 4 tiers instead of 3. 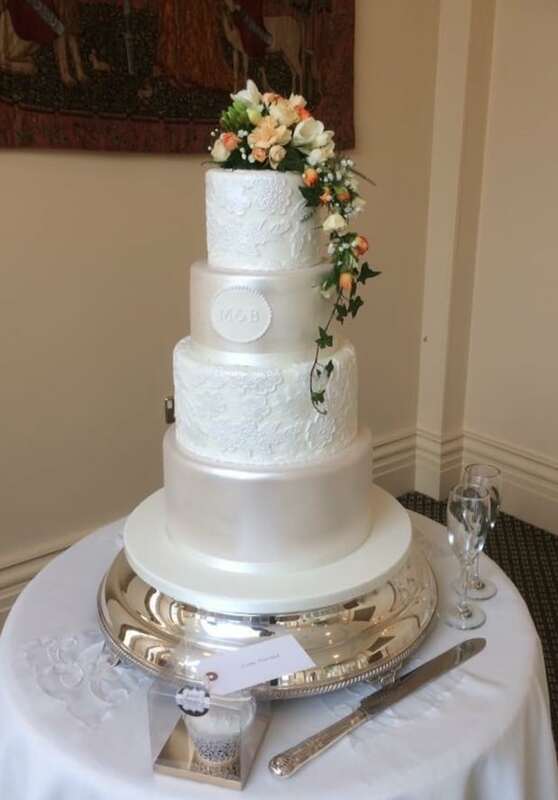 They chose to have one flavour for their cake, the scrummy White Chocolate and Passion Fruit cake with the bottom tier being a dummy tier to give the cake extra lift. They decided to have fresh flowers on the cake which were supplied by Courts of Rayleigh. I also made a wheat and dairy free cupcake decorated in the same gorgeous style as the main cake for one of the guests. Have a long and happy life together!